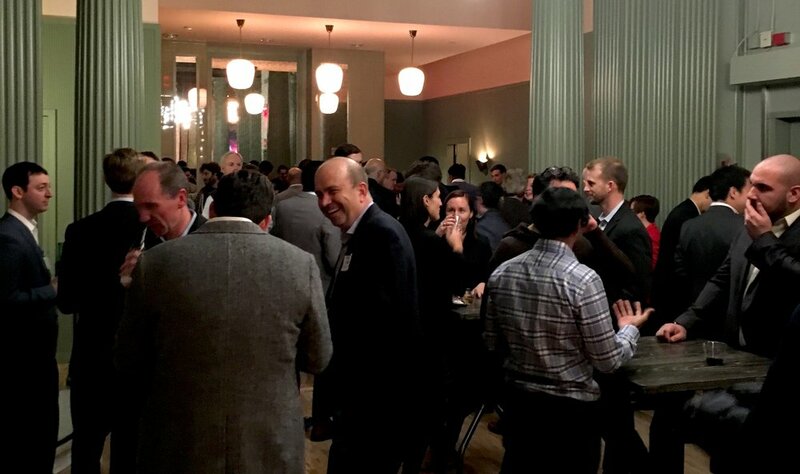 Last month we hosted the first NYC Insurtech event in partnership with American Family Ventures. The idea for the event was born out of our passion for encouraging positive change in the life insurance industry. We’ve been witnessing such a major shift in the way that insurance in general is developed, bought and sold, and we fully believe the way forward is for incumbents and insurtechs alike to learn from each other. New York City is such a hotbed of insurance innovation, we decided to bring some of the city’s best and brightest together to share their insurtech stories. We were delighted to team up with American Family Ventures, given their reputation as champions for innovation in insurance. Principal Drew Aldrich joined our own CEO of North America, Geoff Keast, as co-host for the night. In the end we were blown away by the response. Approximately 80 people attended, packing out the venue, including a good mix of insurers, reinsurers, start-ups and investors. We were happy to see genuine engagement from attendees, with enthusiastic audience participation and networking throughout the night. We’ll definitely be watching with interest to see what comes of some of the new relationships and conversations that were struck throughout the night. The speakers were also generous in sharing their stories and insights to the room. Chris Behling (SwissRE) Opened up the evening speaking about the protection gap that exists in the US market. He discussed the changes in distribution that are underway, but still slow to take effect. Gary Hoberman (Unqork) was up next and discussed fulfillment and the myriad of paper based processes that exist when issuing a new policy today, highlighting a massive problem. He also shared some of his personal opinions on technology really being just a utility, not a differentiator, stating that insurers need to compete at a product level. At the same time he acknowledged that for many products, there is still little to no innovation. After the break we had Jay Bregman (Verifly). Jay spoke about Verifly and drone insurance, specifically episodic insurance and how annual policies are the “barnacle” of the insurance business. He acknowledged that not all insurance is suitable for episodic (life being a clear example), but business insurance is definitely at the forefront. Yaron Ben-Zvi (Haven Life) got a great laugh when discussing the difference between front end and back end, reminding the us that prettying up the front end can lead to massive back-end challenges if they aren’t addressed from the start. He also spoke about Haven’s journey and how they are thinking about the customer experience. He highlighted the challenge that Haven faces, as people don’t typically engage with their life policies frequently, only at renewal or to review when a significant life event has happened. If you’re based in NY and are interested in insurtech, be sure to keep an eye on the Insurtech NYC website for upcoming dates and lineups.